I’ve seen the light. No, not the intense noontime light filtering through the rattan roofing covering the streets of a medina. Not the sunlight sparkling off of multi-colored fractured mosaic tile. Not even the kerosene-powered floodlights turning night into day in the Djemaa el Fna. I understand now why Todd and I needed to go to Morocco - that’s the light I mean. A trip to either Morocco or Southern Spain would be incomplete without the other. If we hadn’t first visited Morocco, the immense Moorish sites of Southern Spain would have been sapped of historical and social context. And, if we hadn’t followed our Moroccan exploration with time in Andalucia, Spain, we would have wondered how the once-widespread North African Arab empire left so few architectural traces of their rule. DAY 1: Morocco must come first, so fly into Casablanca, recover from jet lag, and visit the Mosquee Hassan II to see a tremendous accomplishment in new Moroccan religious architecture. DAYS 2-3: Bus to Marrakesh, get a hostel very near the Djemaa el Fna so that each night you can revel in the intense public gathering and so that every day you can find a new way to get lost in the medina. Visit Ben Youssef Madersa and the Marrakesh Museum (the museum only for the architecture, not for the art on exhibit) and drink lots of fresh orange juice. DAYS 4-6: Ok, besides the kasbah stop, it’s not very Moorish, but it’s a lot of fun. No matter – find your inner Ali Baba on a Sahara tour. DAYS 6-7: Swing through Fes. When you visit the medina, remember to bring a compass or hire a legitimate guide who can show you what remains of the old city, there’s bits of old Moorish architecture throughout the maze of streets. DAY 8: Leave Morocco by ferry from Tangiers. When you arrive in Spain, take a bus to Granada. DAY 9-10: Did you reserve your tickets to the Alhambra in advance? Nice! I’m glad you learned from our mistake. After exploring the Alhambra, follow the advice of our friend Christina, and chill out in a plaza over many glasses of tinto de verano and the inevitable jamon. There’s nothing Moorish about the second day in Granada – Don’t set an alarm clock, you’ll need to rest up for your Granada tapa crawl. 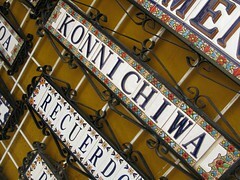 Take a slow stroll around Granada’s old town then head out for tapa and cerveza. DAY 11: Head to Córdoba. 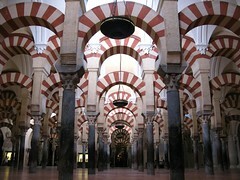 Spend an hour or more staring deep into the forest of columns at the Mezquita. DAY 12-13: Off to Seville to see the Real Alcazar. Toss the non-Moorish Catedral de Seville and Museo Provincial de Bellas Artes into your itinerary too. DAY 14: Get ready to go home. Did you write all your postcards? Update your blog? Good work!